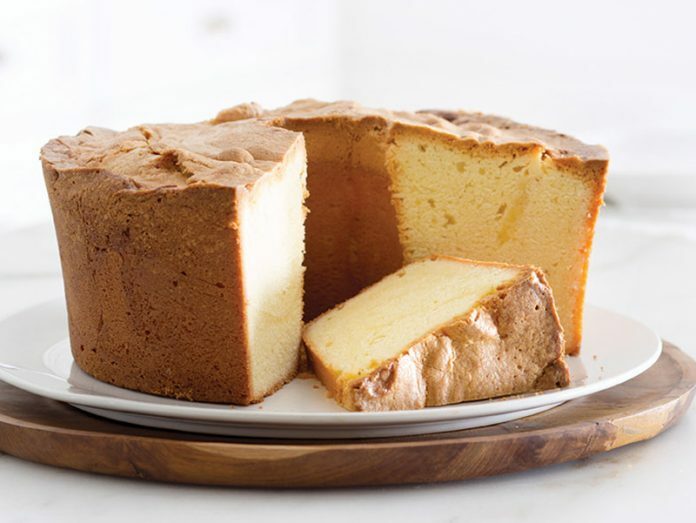 When you say “pound cake” to a Southerner, they usually think of something intensely rich, tall, and capped with a crackling crust of butter and sugar so good that people fight over it. 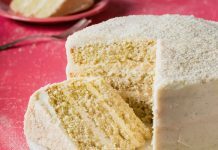 In this cake by Ben Mims, the butter, flour, and egg match in proportion, but the sugar is almost double the weight, which ensures that crackling crust and gives the cake the requisite sweetness that Southern palates are known to love. Cream cheese not only adds extra fat (flavor! ), but also moisture, stability, and some tang to balance all that sugar. Preheat oven to 325°F (170°C). Butter and flour a 10-inch straight-sided tube or angel food cake pan. In the bowl of a stand mixer fitted with the paddle attachment, beat butter, cream cheese, sugar, vanilla, and salt at medium speed until flu y and pale, at least 8 minutes. Add eggs, one at a time, beating until there are no streaks of yolk left after each addition, about 15 seconds. Scrape bottom and sides of bowl with a rubber spatula. With mixer on medium- high speed, beat until superlight and airy, at least 3 minutes. Add flour, and stir with a rubber spatula just until combined. Spoon batter into prepared pan, and smooth top. 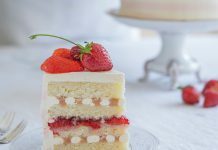 Bake until cake has a lightly raised, cracked dome, is golden brown on top, and a wooden pick inserted near center comes out clean, 1 hour and 30 minutes to 1 hour and 40 minutes. Let cool in pan on a wire rack for 10 minutes. Invert cake onto a plate, and unmold from pan. Turn cake right-side up, and let cool completely on wire rack. true room temperature is vital to the two ingredients incorporating smoothly into the batter. 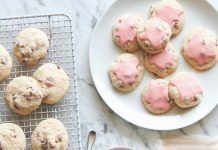 Your best bet is take the butter and cream cheese out of the refrigerator the night before you plan to bake. That way, there’s no guessing that it’s at the perfect temperature and consistency. I have made this two times and just love it. Great made as strawberry short cake.